This next Untappd Catchup came a bit quicker than expected. Melbourne Cup week seems to be a big drinking week every year and this year proved no exception. Sit back and have a read through this run through of 6 pretty distinct beers. Renaissance's Enlightenment Series is one of my favourite series of limited release beers. Sencha Saison was a French Saison brewed with some Japanese Green Tea. It was quite a light saison and I didn't pickup much green tea flavours. It was quite gingery and had plenty of spice. Trip to Farm (Level 12) is why you're reading about it. Everyone who loves Danish beer knows about To Øl. For the last year or so I've been hearing people rave about their Black IPA; Black Malts and Body Salts. WOW! Upon tasting I immediately understood the hype; this beer is incredible! Big coffee, big chocolate, big malts, big hops - this beer is big on everything! This beer earned Hopped Up (Level 23) and deservedly so; it's a 120 IBU's of pine, citrus and herbal hop goodness! This is the best Black IPA I can recall having. Big Shed is one of the growing numbers of South Australian craft brewers. F-Yeah is their American Pale Ale, and one of their beers that I haven't tried yet. The ever-confounding New Brew Thursday (Level 16) badge was unlocked by this beer. It's quite an interesting pale ale with citrus and pine the dominant hop flavours, something I'd usually associate with an IPA, but were perfectly balanced by biscuity malts. I was really impressed by it and look forward to trying it again. International Stout Day this year landed on November 5th. Every year I pull out something I expect to be good on this day and Deschutes' The Abyss was no different. This beer comes seriously hyped, and after tasting it I can see why! It was spectacular! 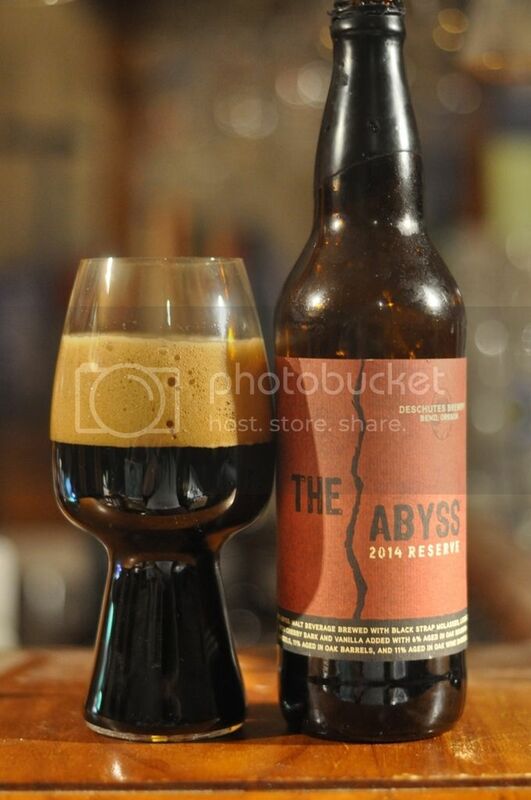 The Abyss is this wonderful mix of licorice, molasses, chocolate, roast, dark fruits, bourbon and oakiness. There's hints of vanilla and cherry as well and the whole thing is brilliantly smooth. Oh - and it clocks in at 11% ABV. I'm so glad I have another one of these, I think I'll put it away for a year or two. My first Belgian Holiday badge that I've unlocked since my trip was Level 25. The beer I had was from St. Feuillien's and though their range of beers may be called Abbey beers, they are in fact a secular brewery - using the former Abbey's name. The beer that unlocked this badge was their Brune, a Dubbel. It was pretty true to the style with plenty of candi sugar and some dark fruit flavours, however it was just a little too sweet to be a great Dubbel. And there we have it, another Untappd Catchup is in the bag. There were some seriously good beers in this batch; particularly the To Øl Black Malts and Body Salts, and The Abyss from Deschutes. Both of these are absolute must try beers. I'm working on getting back to all of you who have emailed me. Nils - you'll be pleased with the next review to follow, stay tuned. Got questions? Email me, gus.norris7@gmail.com or tweet me @Beeroclockau.